US Navy aviation ordnance and rocketry development and test center, in operation since 1943 as the Naval Ordnance Test Station (NOTS) . AKA: Naval Ordnance Test Station;NOTS. First Launch: 1957-06-01. Last Launch: 1958-08-28. Number: 11 . Location: China Lake, California. Longitude: -117.04 deg. Latitude: 35.58 deg. In 1943, adequate facilities were needed for test and evaluation of rockets being developed for the Navy by the California Institute of Technology (Caltech); at the same time, the Navy also needed a new proving ground for all aviation ordnance. The Naval Ordnance Test Station (NOTS) was established in response to those needs in November 1943, forming the foundations of the current Naval Weapons Center (NWC). The NOTS mission was defined in a letter by the Secretary of the Navy dated 8 November 1943: ". . . A station having for its primary function the research, development and testing of weapons, and having additional function of furnishing primary training in the use of such weapons." Harvey Field was commissioned at the auxiliary landing field at Inyokern, and the first facilities of the fledgling NOTS were established there while the building of the actual NOTS base at China Lake commenced. Testing began at China Lake within less than a month of the Station's formal establishment, and by mid-1945 NOTS' aviation assets were transferred to the new Armitage Field at the China Lake site. The vast, sparsely populated desert around China Lake and Inyokern, with near-perfect flying weather year-round and practically unlimited visibility, proved an ideal location not only for T&E activities, but also for a complete R&D establishment. The early Navy-Caltech partnership established a pattern of cooperative interaction between civilian scientists and experienced military personnel that, in the ensuing five decades, made NWC one of the pre-eminent RDT&E institutions in the world. Air-launched rockets, solid propellants, fire-control systems, and rocket and guided missile T&E were NOTS' primary areas of effort in the 1940s. In the late 1940s, NOTS began research on fire-control systems that evolved into the concept of the Sidewinder guided missile. During World War II, the Station played a role in the Manhattan Project as the site of "Project Camel," which developed non-nuclear explosive bomb components--a role that continued into the 1950s. Holy Moses, Tiny Tim, and a family of spin-stabilized barrage rockets were fielded while the Station was built. After the War, the Pasadena Annex was added to NOTS, bringing with it the torpedo-development program and other underwater-ordnance RDT&E efforts. With the advent of the Korean conflict, NOTS began work on an extensive array of rockets and missiles, as well as torpedoes, guns, bombs, and fuses. The ensuing years saw the development and deployment of some of China Lake's most noted products, including the Weapon A, Mighty Mouse, BOAR rockets; and the Sidewinder. By the late 1950s, research at China Lake had expanded into satellite-delivery systems. The Station also played a significant part in the development and testing of the Polaris missile system, including studies and analyses that shaped the Polaris concept. 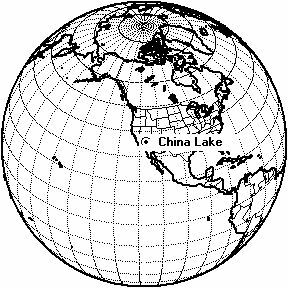 In 1967 NOTS China Lake and the NOTS Pasadena Annex were separated; NOTS China Lake and the Naval Ordnance Laboratory, Corona, joined to form the Naval Weapons Center; in 1971 the Corona facilities were closed and their personnel and functions relocated to China Lake. With the Corona activity came guided missile expertise. During the 1970s, the Center's direction changed along with the Navy's shift to more advanced, computer-intensive systems. Aircraft avionics became a major area of effort. The Center continued to develop advanced versions of the Sidewinder, Walleye, Shrike (including the original HARM program), and FAE weapons. Major support and improvement programs were also conducted for Sparrow, Phoenix, Harpoon, and Maverick missiles. China Lake research extended the technology base in optical and laser systems, advanced propulsion technologies, and anti-radiation guidance. During the 1980s, new projects included the Advanced Common Intercept Missile Demonstration (ACIMD) program, which developed and demonstrated technologies for the next-generation air-to-air missile; the Sidearm and HARM Low-Cost Seeker antiradar-missile programs; the Skipper 2 laser-guided weapon; vertical-launch weapon programs, including Vertical-Launch ASROC; and advanced Sidewinder developments. Parachute systems (including the Space Shuttle escape system) received major attention, as did the further development of full-scale aircraft targets, such as the QF-86 and QF-4. NWC also became a major contributor to the Tomahawk Cruise Missile program. Major China Lake programs include RDT&E and support for Sidewinder, Sparrow, and Phoenix air-to-air missiles; Harpoon anti-surface weapon system; Tomahawk cruise missile; Sidearm and HARM anti-radiation-missile programs; parachute systems and subsystems for aircrews and equipment; avionics hardware and software. Family: Orbital Launch Site. Country: USA. Launch Vehicles: Asp, Project Pilot. Launch Sites: China Lake G-2, China Lake RW. Agency: USN. Bibliography: 2, 580, 9345. 1957 June 1 - . Launch Site: China Lake. Launch Vehicle: Asp. Plumbob test - . Nation: USA. Agency: Livermore. Apogee: 30 km (18 mi). 1958 July 4 - . Launch Site: China Lake. Launch Complex: China Lake G-2. Launch Vehicle: Project Pilot. FAILURE: Failure. 1958 July 18 - . Launch Site: China Lake. Launch Complex: China Lake G-2. Launch Vehicle: Project Pilot. FAILURE: Failure. 1958 August 16 - . Launch Site: China Lake. Launch Complex: China Lake G-2. Launch Vehicle: Project Pilot. FAILURE: Failure. 1958 August 17 - . Launch Site: China Lake. Launch Complex: China Lake G-2. Launch Vehicle: Project Pilot. FAILURE: Failure.